Pierre Trudeau is my least favorite PM in Canada's history. I despise our Charter of Rights and Freedoms. Never should of had Religious Freedoms added. Where is it from? Liberal.ca the official website of Michael Ignatieff’s Liberal Party. It’s up there as part of a photo contest put on by the Liberals. One other entry jumps out too – not so much for being juvenile, but for being unbecoming of a major federal party. In this picture you can see the PM apparently shouting out in pain as he’s being shot. 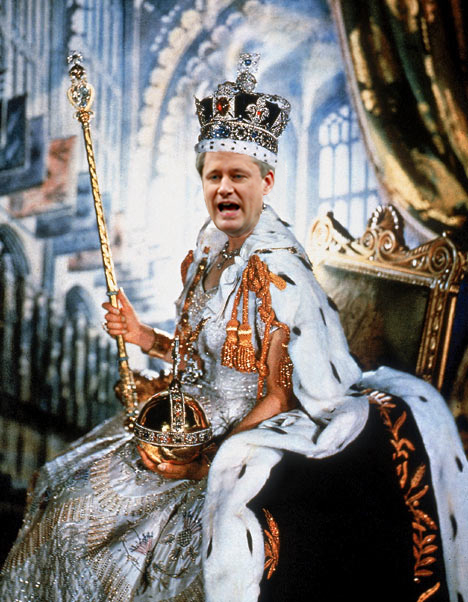 Disrespecting the Crown and Harper at the same time. Oh, Liberals: Did you learn nothing from the puffin incident? Where's all those Liberals who were complaining about conservatives? A Liberal supporter creating that photo is not nearly as bad as the Conservative party creating a pooping puffin ad. An organization can't control its supporters (or social media for that matter), and Conservatives have no right to be pissed off, just like Liberals shouldn't have been pissed off over the Libranos tag that some Conservative party supporter came up with. Call me when the Liberal Party puts a pooping puffin ad on its website and then you'll have something. Until then, this is a made up scandal. The Liberals didn't have to post it on their website. How do you know it was a supporter and not a member of the party? There really isn't that many supporters . Just the usual double standard that has become a Liberal value. Of course it is. But then only the Conservatives can be accused of bias and Liberals are squeaky clean. Ignatieff has sort of slipped but here in Ontario the provincial opposition is in worse shape. Both the Conservatives and the NDP have new leaders but no one knows their name. The Conservative guy is spelled Hudak although I don't know how it's pronounced. "Whodat" will do for the mean time. Why can't we all take the logical course and agree that both are definitely up there in terms of stupid moves and bad play. As far as I'm concerned both make me a bit sick. The liberals deserve a blasting on this one. A bird shitting on the PM, is more offensive than a nutbar killing the PM. Give me some of dat herb mon ! If you were trying to be sarcastic you forgot the "/sarcasm" quote nub. Last edited by Bodah on Tue Dec 15, 2009 5:33 pm, edited 1 time in total. Provided Tim Hudak doesn't pull a John Tory I'll be voting for him next time around... not that it will fix our HST problem but "Taxes McGuinty" doesn't deserve to remain in office any longer. I have kept a list of the things McGuinty spent serious money on that were, well, we didn't get much for the money. However the public didn't notice, not yet. That's the way it is at this time.